There will always be room for one more player when they play online bingo. Grab your easy chair and head over to Bingo Room where enticing promotions and a dynamic playing field that is just a moment away. The little red house is a signature icon representing an emporium of bingo gaming under one very prestigious roof. It is the internet gateway to one of the most world class software in the industry. Parlay software is synonymous with the word bingo itself. Bingo Room has compiled a list of comprehensive gaming that breaks the barrier between local bingo halls and turns it into a bingo player’s final destination. Every aspect of the site is done with ease including banking, playing and navigating. The interface captures all the major features that have the highest interest to unique visitors. The Winner’s Circle has impressive jackpot wins from players who have thousands. Maxi’s Blog keeps the momentum going with the latest surprises and specials. Bingo Room does not require download with Flash version instant accessibility. Owned by the Bingo Worldwide Limited, Bingo Room is one of many successful brands on the internet today. Playing 90 ball and 75 ball bingo couldn’t be easier with well designed rooms that are easy to understand. Cards are automatically daubed and the winner is automatically declared with no worry about missing a bingo. Progressive Jackpots are available on certain game throughout the day. There is an Options button located at the top of the screen where players can customize their game. Options include choosing the color of your dauber, daubing your own cards and muting sound. There are 5 Bingo rooms to choose from including the Budget Bronze Room for the more conservative players. Quick Buy is a nice feature that has a series of numbered set cards to choose from without having to pick them one by one. If your game is disconnected during play the system will automatically keep your cards in play and credit your account in the event you win. Fair and Square games offer players an equal opportunity to win with a set number cards per player purchased. The Quarter room features these games and allows a max of 36 cards unless otherwise indicated for specials. As if bingo is not lively enough, there are more gaming options to keep your excitement up with Casino games, Slots and Poker. Slots offer huge jackpots on selected games. Bingo Room will start the party off with a bang, inviting all new players a Free Trial chip to try out the games with no obligations. Deposit Bonuses are based on the size of the deposit made. The larger the deposit the higher percentage bonus will be awarded. 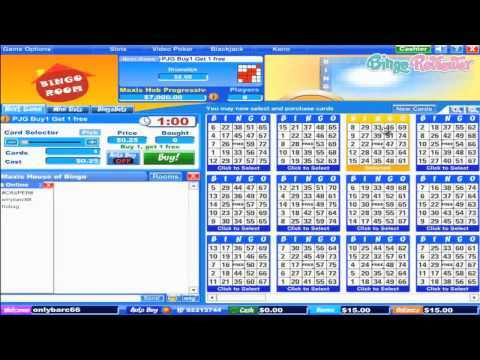 Bingo Bucks (BBs) are awarded during bingo games with Chat Wizard as your host. Only depositing players are eligible for to receive BBs. A minimum of four cards must be in play in order to qualify in chat games. All BBs will be deducted at time of cash out and can be replenished during play once another deposit is made. A Member Rebate on each deposit made during the month will be returned the first day of the next month. The amount rebated is calculated by the deposit and a percentage will be rewarded back into the players account. Casino Free Rolls are offered to the highest scoring player where they will win a cash prize. The Pick a Prize Board is available every month where players can pick the prize of their choosing. Every cash wager including Slots, Video Poker and Bingo will earn players points with the Points Program. These points can be traded for Cash and BBs. The more you play the quicker your points add up. The promotional offers are both plentiful and intriguing. The US friendly site has a complete well rounded package of games that are appealing to a worldwide market. We rate Bingo Room with 3.75 Hearts. I love the simplicity of bingo room. I feel like sometimes sites tend to get carried away with all the gimmicks when really, we’re all just there to play some good games. You will catch me there almost every day at noon for their absolutely free 90 ball games in the top shop room. After that, I head over to Maxi’s H.O.B. Room which is open 24 hours a day and the bets are super low. I love great deals as I’m sure everyone else does and bingo room certainly has them. They even offer speed dime games all night long with a multi-reset progressive up for grabs. Like most sites, it pays to be a VIP. With each deposit you make, you will climb even further up the VIP status ladder, and earn benefits like safe cracker codes to unlock cash and prizes, free seats to participate in weekly slot and video poker events plus tons more, it’s ridiculous! "Great Friends, Great Times, Great Bingo" - that's what Bingo Room is all about and it pretty much says it all. For the most part you couldn't ask for more than those three simple ideals. I "liked" bingo Room on Facebook, and I visit their FB page from time to time to find out what's happening and what's new at this site. One of the exciting happenings going on now is the reverse coverall, a return of a popular game at Bingo Room. For those interested in grabbing as much bingo winnings as possible you will want to head on over to the H.O.B room. You'll want to get your share of the $80,000 in prize money being tossed out to the lucky winners! Every Weekend they have fixed $100 pots and the reverse coveralls play between six pm and midnight on Thursday-Sunday nights. You also wont want to miss the special coverall game playing 3 times a night featuring a starting pot of $100/48 calls. For every call past 48 they are adding $15 extra to the jackpot. So, the longer it takes for Bingo to be called, the more cash is up for grabs. Not only that, all the other games 6-12pm will be fixed $100 pots. These are just a few of the great things in store for players at this US friendly site. Add them to the great bonuses and prizes, well, you'll just be loving this Bingo Room. It is now a regular thing for me to visit Parlay sites and there's a good reason for it, good starting bonuses, great games, and at least for me, a good payout rate. This site is right there among the best. The starting bonuses are good, you begin with a $15 no deposit bonus, which is a thing that I really like, if nothing, just to make sure I see how the games work. I usually don't win much from that type of bonus, and this time was no different. Depending on the amount of your deposit, you can get up to 400% bonus on every single deposit, and that's really impressive. There are five rooms. MAXI'S H.O.B, The Palace, Blitz Easy, Silver Stitches Dimes and 90 Ball Top shop. Like many sites I have seen and played before, this one only has 75 and 90 ball games, and that's fine by me.